How important is it to get a second opinion? Ask any of the over 1.7 million athletes screened by the Special Olympics Health Program. In 1993, when Rosemary Kennedy went for her routine dentist visit in Wisconsin, her team of dentists recommended removal of all her teeth. To do this, however, they needed permission from her legal guardians, Eunice Kennedy Shriver and Senator Ted Kennedy, who refused to accept this recommendation and sought a second opinion from Dr. Steven Perlman, a pediatric special needs dentist in Boston, Massachusetts. Dr. Perlman subsequently performed an oral rehabilitation on Rosemary and was able to restore her entire dentition without the removal of any teeth. “After successfully treating Rosemary, Mrs. Shriver challenged me to create a program within Special Olympics to provide health care for all of the athletes. 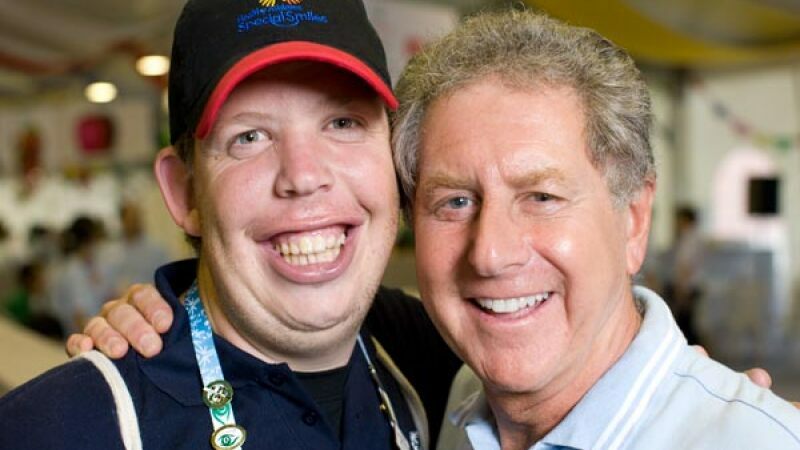 At the Massachusetts State Games in 1993, my colleagues and I at Boston University screened everyone competing.” This was the moment health care changed for people with intellectual disabilities and the beginning of Special Olympics Healthy Athletes, explains Perlman. Around the same time, New Jersey optometrist Dr. Paul Berman recognized a gap in the vision care offered to people with intellectual disabilities. With Special Olympics and the American Optometric Association, Dr. Berman led the creation of vision screenings for athletes. These two programs, now known as Special Smiles and Lions Clubs International Opening Eyes, were the seedlings that have helped make Special Olympics the largest global public health organization dedicated to serving people with intellectual disabilities. Dr. Paul Berman at an eye screening. Drs. Perlman and Berman recruited health care professional volunteers to conduct screenings, educate their colleagues and the athletes in preventing health problems and provide referrals for follow-up care. As a result, the programs improved the health of athletes while simultaneously training health workers how to treat people with intellectual disabilities. They were so successful, Special Olympics included oral and vision health programs for athletes in the 1995 World Games in Connecticut. The results were shocking: 29% had untreated vision problems, 68% had gingivitis, 33% had tooth decay and a whopping 15% were sent immediately to the emergency room with acute pain or disease. These were athletes who were deemed healthy and fit to compete by their providers at home. Tim Shriver, son of Eunice Kennedy Shriver and Sargent Shriver, was particularly appalled by these findings. This is the moment the Shrivers made a commitment to ending health care discrimination against people with intellectual disabilities. The data from the 1995 World Games was undeniable, so in 1997, Special Olympics launched the Healthy Athletes Program. 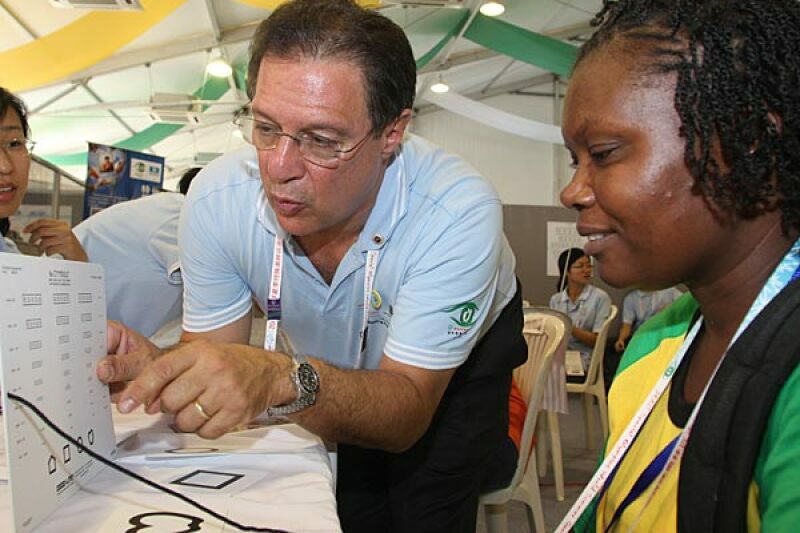 Since then, Special Olympics has delivered 1.7 million free health screenings to athletes in 130 countries. This is game changing for children and adults who have typically had no access to health care, or sub-standard care. In 2012, Special Olympics received the support of Tom Golisano, Founder and Chairman of Paychex, Inc. and the Golisano Foundation, an advocate and supporter of services for those with intellectual disabilities for much of his life. The Golisano Foundation is one of the largest foundations in the U.S., dedicated exclusively to providing support for people with intellectual disabilities. “I have a family member with an intellectual disability so I know the difficulties a family faces when trying to find a qualified physician willing and educated to treat their loved one with a disability. And if it’s difficult to find care for someone with a disability in America, we know it’s even more difficult to receive care in other parts of the world. Special Olympics global reach and infrastructure made it the perfect partner for us to launch Healthy Communities to expand critical health services for those with intellectual disabilities on a global level, moving health care for people with intellectual disabilities out of tents at special events and into communities” explains Golisano. Tom Golisano and Ann Costello observe an eye screening. Golisano has committed more than $37 million to Special Olympics to train health professionals and provide year-round access to health care for people with intellectual disabilities. Healthy Communities accelerates inclusive health for people with intellectual disabilities by empowering advocates and families, leveraging local resources and engaging partners like universities and community-based health care organizations. Tom’s generous gift was recognized among 30 great givers and causes on Forbes' "Philanthropy's Big Bets for Social Change of 2015” that featured the most promising philanthropic gifts aimed at solving social problems in the U.S. and around the globe. In the short time the Golisano Foundation has been involved with Special Olympics, the average number of Healthy Athletes screenings has increased by 150 percent, screening 45,000 more athletes per year. Additionally, over 3,000 new health care professionals have been trained and Healthy Communities advocacy is engaging the next generation of health workers to be trained in how to treat people with intellectual disabilities. With the support of the Golisano Foundation, Special Olympics is expanding year-round access to quality health care around the world, reaching almost every continent. 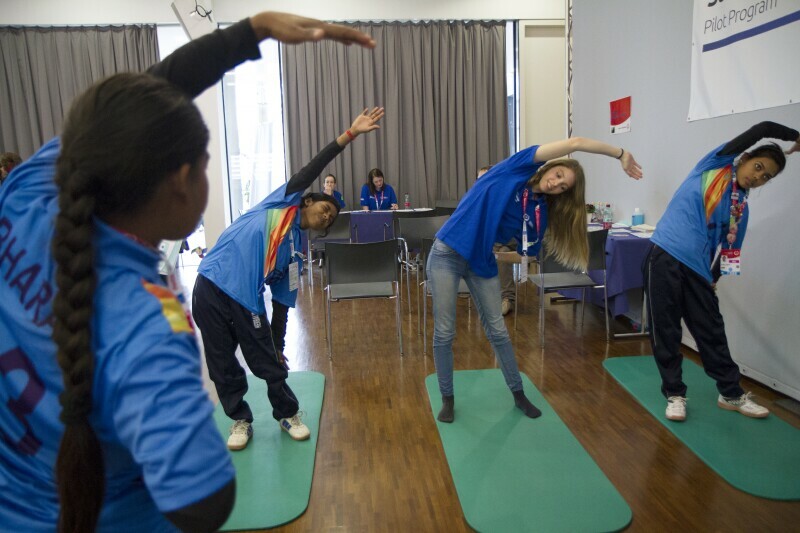 Healthy Communities was piloted in 14 Programs and is now in funded globally in 80 Special Olympics Programs around the world, with a goal of 100 Programs by 2020. Special Olympics athletes at a Strong Minds event. To recognize the progress being made around the world to increase access to essential health care for people with intellectual disabilities, the Golisano Global Health Leadership Award was established. It is Special Olympics’ highest honor for health partners. In 2017, at the Special Olympics World Winter Games in Austria, Chairman Tim Shriver and Director of the Golisano Foundation, Ann Costello honored seven health care organizations and professionals who are on the frontlines of bringing essential and often unprecedented health care services to the most marginalized people on Earth. The 2017 honorees are health champions in their countries and hail from Peru, Egypt, Uganda, Thailand, China, Belgium and the United States. Their extraordinary efforts are fulfilling the goals, values and mission of Special Olympics Health: inclusive health care, wellness and fitness for people with intellectual disabilities. These recipients have changed university curricula to include training for providers for people with intellectual disabilities, provided free of charge health screenings and delivery of crucial follow-up care and started mobile clinics in rural areas where there were no health facilities. One example of the many positive health changes being realized through Healthy Communities is Joyce, a young girl who lives in Uganda. Joyce couldn’t walk or stand properly. Her family tried to straighten the bones in her legs by digging a hole in the ground and packing her in it with soil. Joyce would stand in the hole every day for up to six hours. This was the only therapy the town knew to try and fix Joyce’s legs. Volunteers from the Korea International Cooperation Agency (KOICA) came to Joyce’s village and taught Special Olympics coaches and family members physical therapy techniques that would help her. Now Joyce can run, play, write, read and attend school with the other children in her village. Joyce (right) and her father at their home in Uganda. Over the past 20 years, the game has changed for people with intellectual disabilities, thanks to the thoughtful and committed Eunice Kennedy Shriver, Dr. Steven Perlman, Dr. Paul Berman, Tim Shriver, Tom Golisano, Ann Costello, Director of the Golisano Foundation and all the dedicated clinician, partners and volunteers. Access to health care for people with intellectual disabilities is dramatically changing thanks to Special Olympics and its partners. Where did it all start? Rosemary Kennedy’s second opinion. ESPN and Special Olympics have teamed up on a year-long storytelling initiative telling the stories of game changers and game changing moments toward inclusion. Check back each week for a new story of inclusion.